Tottenham 1991 by Bernette Hall. Acrylic. A picture of calm in an inner city estate. The name Broadwater Farm has become synonymous with the killing of PC Blakelock. A tragic story around an extremely awful time in the life of Tottenham. Broadwater’s story starts in the late 60’s. Another concrete city grown with high ideals and not a lot of forward thinking, a good idea gone bad, amongst many others of its kind, this was Broadwater Farm Estate. By the early eighties the housing was poorly maintained, the concrete had began to rot, ageing electrics failing, and the inherent design flaws made blind spots and pockets for crime - a dangerous area to live. Unemployment and injustice was rife; many of these types of estates existed, seething with anger and resentment brought on by institutional racism and poverty. In September 1985 a riot blew up in Brixton. This caused a ripple effect of tension into Tottenham and Broadwater farm. A month later an event eerily similar to the one in Brixton, where a local mother died in the hands of the police, sparked a riot exploding across Broadwater farm, ending with a policeman PC Blakelock being murdered by a gang with guns and machetes. In the aftermath of these events the community was shaken, spooked, desperate and disturbed by these incidents. The council had talked about knocking these estates down, but the tenants refused to move out. So born of these traumatic events, the local council decided to invest £33 million to renovate the estate spending it on new designs, individual identities to the housing, getting rid of the dangerous walkways, relocating the shops and redecorating the area. This was all part of the big push to pull Broadwater Farm out of the misery and despair it was living in and amongst these changes a mural was commissioned. The first piece was a Peace mural created in 1987. 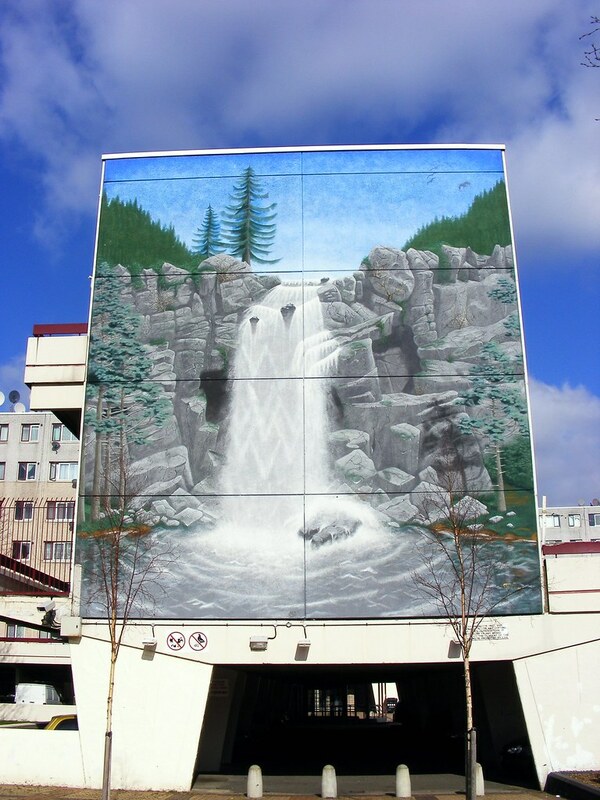 A few years later in 1991 mural artists Bernette Hall and Donald Taylor were commissioned to create the calming mural of a waterfall on the side of Debden block, perhaps a reflection of Broadwater Farms watery past, or perhaps to inspire a calming relaxing idyll. You can hear one of the artists Bernette Hall himself, talk about that time, his inspiration and his experience in creating it. He talks of how as a kid walking through the estate at night he could hear the rain falling off the roofs and how it sounded to him like waterfalls. He talks of how the residents helped choose the image and they decided to do the painting in such a way the waterfall could have been from anywhere, to embrace all the cultures living there. The Waterfall mural took 7 and half months and 2 dozen brushes. Due to the wall being pebble dash, the artists had to beat the paint into the walls with the brushes. They used scaffolding to work their way across the wall, though at times this got quite scary in the wind and the rain as it would shake and sway. It sounded like a lot of hard work but it’s a testament to that hard work that it’s still standing today and much loved and appreciated by residents and visitors alike. Both murals still stand today and Broadwater Farm’s efforts to pull itself out of the doldrums has paid in dividends, a beautifully renovated area, with very low crime rates in comparison to it’s past.It was once described as one of the worse places to live in the whole of the United kingdom, that was back in the eighties. Today Broadwater Farm has out-grown that label and has gone on to become synonymous with racial harmony boasting 39 different cultures in it’s community and at the start of the new millennium Broadwater Farm shows the capital that estate communities have the potential to turn it all around and become vibrant, safe and wonderous places to live. It would be nice to think perhaps those four figures of peace and the calming presence of a waterfall helped to inspire and encourage a peaceful way forward. The mural looks in good condition. Take the overground train to Bruce Grove Station. From the station, take a left into Bruce Grove. Find bus stop K and catch the W4 bus which will take you straight into the estate.